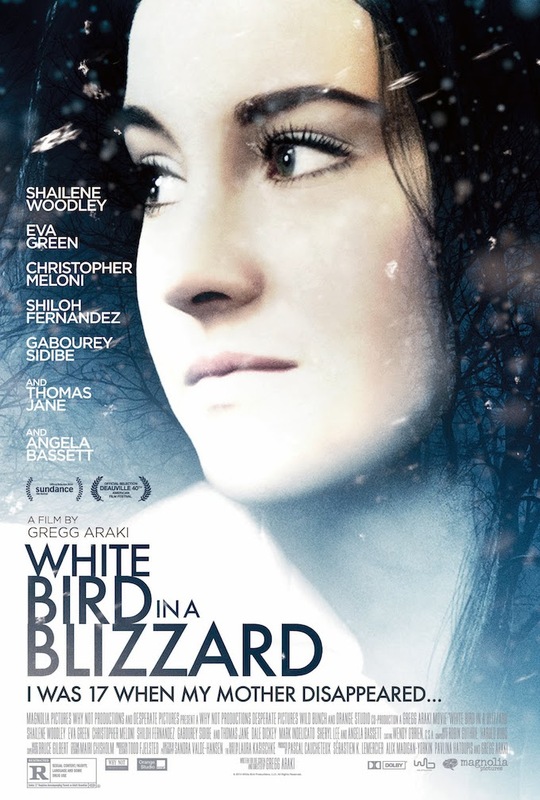 Part coming of age story, part mystery, Greg Araki's WHITE BIRD IN A BLIZZARD is told from the point of view of Katrina “Kat” Connors (Shailene Woodley) as she recalls when she was seventeen and her mother Eve (Eva Green) disappeared without warning or trace. Eve's marriage to Kat's father Brock (Christopher Meloni) was not a happy one, with the formerly adventurous Eve resentful of being forced into the role of traditional homemaker. She drinks, and takes every opportunity to snipe at Brock, even threatening to leave on several occasions. Still, it's a bit of a surprise to Kat when she seemingly follows through with those threats. Oddly, though, Kat finds she's not all that upset about her mother's departure. In recent years, her mom had seemingly become jealous of Kat's budding sexuality, even going so far as to drunkenly flirt with Kat's dimwitted boy-next-door boyfriend Phil (Shiloh Fernandez). Besides, as Kat reasons, Eve made the choice to leave. Or did she? Araki imbues his film with a haunting strangeness that recalls his previous foray into mainstream territory (by the culty-campy standards of the guy who made THE DOOM GENERATON and KABOOM!, at least), 2004's MYSTERIOUS SKIN. Yes, there are a lot of elements in the plot we've seen in other films, but the resolution of the central mystery still manages to surprise and be reasonably satisfying. Araki's style helps to keep things interesting in the film's more mundane moments, as does the strong cast (which also includes Gabourey Sidibe, Thomas Jane, and Angela Bassett in supporting roles). In the end, though, despite there being a number of things to like and admire about the film, I found myself just not really feeling that strongly about it one way or the other. It's... okay. Sure it has some weirdness to it, and some of Araki's favorite themes about sexuality and repression are here, albeit not as overtly. Still, WHITE BIRD feels very much pitched down the middle, just another "Sundance" movie for the indie crowd who don't want anything too different or challenging. That's not something I'd ever have expected to say about an Araki film . 2 ½ out of 4 stars.